A Gentle Giant Release! Luke Skywalker took part in the Rebel Alliance's attack on the Death Star at Yavin IV, making the famous 'trench run' that led to the destruction of the Empire's Death Star, saving the rebel base on Yavin from certain annihilation. 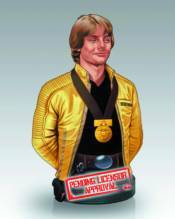 Gentle Giant Ltd. is proud to bring you the Luke Skywalker, Hero of Yavin Mini Bust! Digitally sculpted by our master artisans, using actual archival footage and designs, each Luke Skywalker Mini Bust is rendered using the highest quality polystone, and hand painted. Each piece comes individually numbered and is paired with a matching Certificate of Authenticity. May the Force be with you. MAZ KANATA - STAR WARS MIGHTY MUGGS ACTION FIGURE METAL ACTION MAZINGER Z BODY LTD. ED. RAZOR'S EDGE [Empire & Rebellion #1] Ready, Set, Podrace!